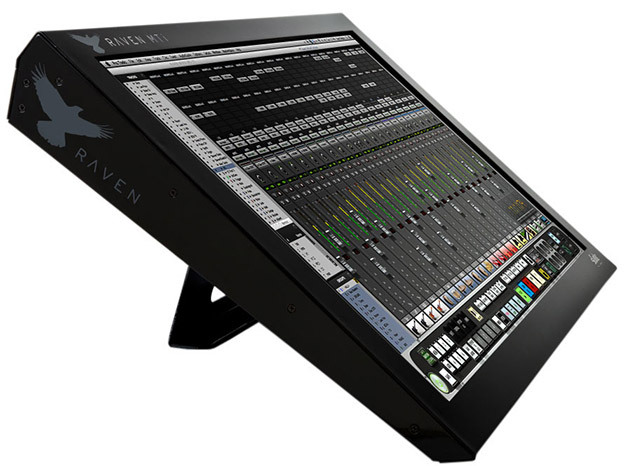 Steven Slate today introduced the 2.0 update to the Raven Control System with many new features that, according to Steven Slate, will blow your mind and want to buy a Raven right away. In a new video posted on Youtube, Steven shows off the new features of Raven 2.0 Control System. One of the main new features is the Batch Command System that allows you to handle complex tasks with the press of a single button. The Batch Command System can execute a combination of up to a 1,000 key commands, menu selections or mouse cicks by pressing a single button. Steven shows this by setting up headphone sends on multiple tracks with a single swipe and a press of a virtual button. He also installs his favorite compressor plug-in on all drum tracks with a single swipe to select the tracks and then one press on a virtual button to insert the plug-in on all selected tracks. There’s lots of other new features like drawing automation with your finger, creating fades fast, Faders 2.0 with Fine Fader Mode to increment faders by 0.5 dB and much, much more. He also shows a dedicated comman called Audio to midi that allows you to turn an audio Snare recording into midi notes with one press. There’s so much more that Steven shows us in the 12 minute long video so I’ll just let you enjoy it for yourself. The Raven 2.0 update promises to be an impressive update. In the video, Steven focuses on RAVEN Control for Pro Tools, but RAVEN Control also supports Logic X, and will soon support Cubase, Nuendo, Studio One, and Digital Performer. RAVEN 2.0 is set for release on June 27, 2014 and will be a free software update for all RAVEN users. Now that’s something to look forward to.